Posted on January 20, 2007	by Linda S.
Michael Cook from Farmer’s Branch, TX has a website called Clues for the Clueless and has recently had a segment aired on an episode of HGTV’s That’s Clever. Michael raises silkworms, spins the threads, dyes the thread and then does card weaving (among other lovely things)… yayyyy! The entire video segment is shown on his website .. or you can find it here at You Tube. 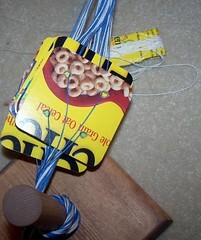 The pic on the right shows my Cheerios tablet of cards that I use for tablet weaving… and they work. With these cards, I made this… in about 40 minutes. This was my first try using the tablets and remembering how many turns I had done forward or backwards was a trial for “short term memory”…grin Therefore…the pattern is a bit off. Since I don’t have a loom, I tie one end to the leg of an end table and stretch the work in front of me. This is one of those things that can actually be attached to a belt and by tilting your body back, you can set the tension on the weaving. Makes it very distressing, though, if someone knocks on the door…. This entry was posted in Card Weaving, Crafts, Embroidery, Handcraft, Handwork, Historical Textile, Tablet Weaving, Weaving. Bookmark the permalink.